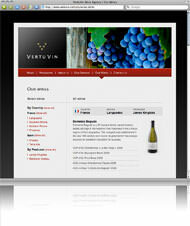 Today saw the launch of VertuVin.com. VertuVin are a wine agency providing the valuable connection between the wine producers and the buyers, importers and distributors who bring those premium wines to our shelves. Dare to Think worked to design a develop a stylish site with added flexibility to include additional language variations at a later date. Stephen Cronk, Managing Director and Co-Founder, of VertuVin is chuffed to bits with what we’ve produced and is looking forward to marketing the site worldwide.